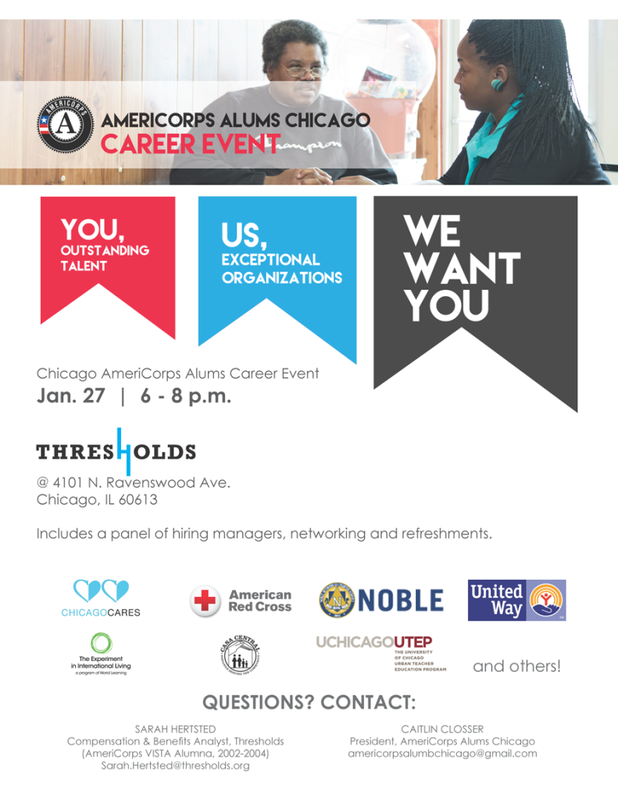 Career Event on Tuesday, January 27 from 6 – 8 p.m.
Held at Thresholds, 4101 N. Ravenswood Ave., AmeriCorps alumni are invited to to come meet with exceptional organizations, seeking talented individuals for open positions at the AmeriCorps Alums Chicago Career Event. Join us for networking and light refreshments as you learn more about these organizations and programs. Interested in a career at Thresholds? Apply online at www.thresholds.careers. This entry was posted in Community Event, News and tagged American Red Cross, AmeriCorps, AmeriCorps Alumni, career, career event, career fair, Casa Central, chicago, Chicago Cares, Experiment in International Living, job, job search, Noble Network, talent, United Way, University of Chicago. Bookmark the permalink.